Better than Earthwarden anyways, even considering the lack of +def. Drops from trash in Serpentshrine Cavern. Obviously an amazing tanking weapon for feral druids. this is much better then http://www.wowhead.com/?item=31334 if you're a tank druid, but http://www.wowhead.com/?item=28658 is amazing if you're just a dps druid, imo. Wouldn't the hp be (42 * 1.25 = 52.5 stam) = 525hp ? 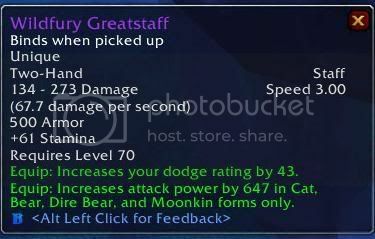 yes this change is really good , since they gonna make a huge buff on clefthoof set as of armor u really dont need this staff to have 630 armor but more dodge-stam. Stats updated further in 2.1.0 ptr. Equip: Increases attack power by 731 in forms. Dropped last night off a Murloc in the tunnel to Morogrim Tidewalker. Holy 2.1 stat upgrade. i was lucky enough to get this on our first night in SSC. its particularly annoying at a time when most druids would be (or already should have) replacing the clefthoof set with tier 4 pieces and lost treads/longboots. thats losing a lot of defense all at once, almost necessitating that you use peripheral (neck, cape, wrist, belt, both rings, possibly one/both trinkets) for defense or resilience items. another option is to use resilience more... the new pvp bracers, possibly belt.... timelapse shard is also nice here. personally my goal has been to avoid having to use one of my trinket slots on an all defense item (like Dabiri's, Figurine, Hydross trinket etc.) because theres much better options imo. this became a rant. the short version: it kinda bites that the great end game druid tank gear seems to leave out defense/resilience more and more... forcing us to compete with prot warriors and prot pallies for defense accessories that in all honesty benefit them way more than us. edit: /agree with Brachamul about the agility... not only would it be more threat for tanking, but would make this even more viable as a DPS/hybrid staff. I use it in cat form because i've never had the Stranglestaff drop and its better than the Dragonstaff, nor have i ever amassed the arena points for Gladiator's. Agility instead of dodge would give it more AP/crit than Stranglestaff making it an effective upgrade if youre willing to drop the hit. anyone else find it lame that you have to go to Hyjal to get an upgrade from that Kara staff? boosted my alts tanking gear miles! Considering the current change to drop attunement from SSC, how well geared would the raid have to be in order to clear some of the trash for a chance to get this weapon? +24 feral combat skill rating = 24/3.9 = 6.15 feral combat skill. So, 6*0.1 = +0.60% extra crit chance against mobs above your level. Why would you even mention parry and block? 1) Druids have only 2.6% chance to be crit with SotF and 0 resil/defense. You could waste your stat points getting 75 defense, but druids will get crushed 15% of the time anyway, which can not be avoided. 2) Druids take less damage. A warrior with 65% DR will take 40% more damage than a druid with 75% DR. The warrior takes 35% of the total damage. Druids will take 25% of the total damage. So you see, the warrior is taking 7/5 the amount of damage the druid takes, which is 140%. 3) Stam, Dodge via agility, then dodge via dodge rating are your best bets once at the armor cap. Making the pillar of ferocity even more useless as it is. Has been implemented now, I'll let it stay here so people can see how it used to be. Now if they would drop the dodge, and split that stat budget up between agi and defense, we would really have something here. This is obviously a druid tanking weapon, so why not spend its stat budget with that in mind? It is disappointing to see obvious mistakes made (or worse, blatant disregard) for druid gear itemization. I wont even start on the Pillar of Ferocity. The lack of defence on this weapon is due to the fact that by the time a tanking druid is entering SSC he/she should be able to reach the uncrittable mark through rings/neck/cloak/trinkets (perhaps supplemented with a piece of arena/PVP gear) and no longer need the defence provided by the earthwarden. Awesome staff, dropped so often for my guild it ends up getting sharded because all of our druids and some of our mages have it (yeah, funny). Probably the best tanking staff in the game, since ~30 stamina is barely equivalent to 2.5% dodge which keeps your healers happy since it's more physical damage mitigation and you already have like 21k health in SSC, do you really need to hit 30k in BT? That said, Terestian's Stranglestaff is arguably better for kitty dps because of the +hit and +agi on it, even if there is 22 stamina and around ~50 attack power lost. It means that you can focus on more agility or more expertise because your staff took care of your hit rating. Druid itemization is still a joke though, and we're still rolling against rogues on their gear. Anyone else notice that the drop list has it dropping from Galak Windchasers (level 24-25 mobs) 4 times? What could cause that type of anomaly with the data? I wonder if people are using the Wowhead client on private servers and skewing data. Got it on the first trash pull of our first SSC. I was a little ecstatic, to say the least. Without doubt the best tanking weapon for Druids. This staff is the best staff for survivability, the stats on this would make most feral druids drool. However, the thing that makes me cringe at this weapon is not the lack of defense but the lack of expertise. Picture tanking a boss and two of your attacks are parried and immediately followed are a couple crushing blows. You can't dodge a crushing blow and the stam increase you get from this weapon won't be enough to keep you alive from some of the hard hitting bosses out there. Keep in mind I'm not rocking T6, there aren't alot of leather tanking pieces out there with the very much needed expertise rating. I tried OTing Kara before i got the Earthwarden and I felt embarassed i couldn't hold aggro because i was still using Braxxis Staff of Slumber. When I got Earthwarden and the rep. based neck piece from the Shattered Sun. It has made all the difference in my TPS. This staff is incredible when you have other gear to make up for the loss in defense and expertise that you get from Earthwarden. Some poeple may want to stroke their ego when they see they're health and dodge rating jump several percentage points; not me. I'm more concerned about doing ALL the things a tank is supposed to do. Making it easy to heal you and holding aggro. If your still wearing T4 I would hold off until you get a decent amount of expertise before wearing this weapon. You're gonna be ! @#$ed, our Feral Drood MT got it his first time in SSC. Currently grinding trash for this staff for Transmog for my feral druid. It has an amazing looking model and fits the armor models at lvl 85 pretty well. hmm I could have sworn there were more than just 2 staves with this model in game. I remember when I first saw this graphic in BC days. I couldn'tve even imagined a cooler looking druid staff. Now coming back to the game again I will have it!